JCU scientists say 10 percent of the coastline adjacent to the Great Barrier Reef is now affected in some way by development and have called for a new approach to protect critical environments. James Cook University scientists have revealed that 10 percent of the coastline adjacent to the Great Barrier Reef is now affected in some way by development and have called for a new approach to protect critical environments. Study co-author and Senior Researcher at JCU, Dr Nathan Waltham, said ‘business as usual’ is no longer an option because the altered coastline is fracturing natural habitats. “Development has flow-on effects to coastal estuaries and reefs, with potentially large negative impacts on the coastal areas that we build our lives around,” he said. The study found that seaside developments were approved on a case-by-case basis, leading to an ad-hoc mix of structures impinging on the area. It said if modern-day coastal areas were going to function as a productive ecosystem, new developments needed to demonstrate broader benefits to their construction. The scientists argue there is an urgent need for policy and planning instrument reforms that take into account accumulative impacts of urban and industrial development in the Great Barrier Reef area. The data show that break walls and pontoons and jetties dominate waterfront development, contributing to approximately 10 percent (equivalent) of the coastline linear length. Sixty percent of development occurs along the coastline or within the first few kilometres upstream along estuaries. 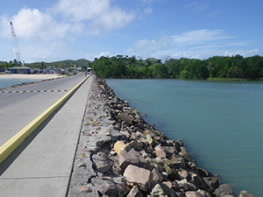 The team said the dredging of coastal inlets and waterways - combined with the construction of coastal seawalls – has led to rivers being channelized. This has resulted in water quality and erosion problems and limited fish access to nurseries and settlement grounds. They said relatively inexpensive eco-friendly solutions should be applied to the repair and revitalisation of existing artificial structures before any new urban or industrial development and expansion is approved.